There’s been much debate on the EBSQ Member Forums of late about the quality (or lack thereof) of many recent show entries. And the quality issue has next to nothing to do with the art itself. 1.) Does the piece meet the prospectus? Does your work logically belong in Show X? If you’ve entered a piece of a happy cat in winter and the theme of the show is self-portraits, then no. Really, no. Just don’t do it. Unsure? Read the prospectus. Still unsure? Ask. Please. 2) Did you include a statement that explains why you feel THIS particular piece belongs in THIS particular show? Maybe you think your entry’s appropriateness is obvious. But we don’t live in your brain. Give us a little something about your piece as it pertains to the prospectus. This is all the more important if your piece is abstract or if your piece makes an unusual interpretation of the show guidelines. Pieces with relevant text are greatly preferred by members weighing in on this issue in the EBSQ Forums. I cannot overemphasize how important it is to include a quality artist statement. And the inclusion of text also makes your work easier to find both on our site and in search engines, so not including a piece-specific statement can actually be detrimental to your success on EBSQ. It’s food for thought! 3) This goes hand-in-hand with #2–Is your statement just a sales pitch? 4) Is you piece presented in a professional manner? Here’s where the more objective quality attributes come into play. Is your piece properly cropped? Is there glare? Is it in focus? It doesn’t matter if it’s the most brilliant portrait of Caesar ever painted and epitomizes everything about the prospectus, plus has a pitch-perfect artist statement included. If it’s not a quality jpeg, you’ve just shot yourself in the foot. 5) Is your piece any good? Well…the show voters will certainly weigh in, but in the end, only you can answer that one! So–did we miss anything? What do YOU think makes an exhibit entry stand out from the crowd in a good (rather than a cringe-worthy) way? 2011 is shaping up to be the biggest year for juried exhibits in EBSQ’s almost 11-year history, with our first juried show of the year, Motion Photography, accepting entries through the end of March. We recently sat down with this month’s juror, photojournalist Eric Schmadel, to learn a little about his background, his approach to photographing objects in motion, as well as some concrete tips for getting your best shot. My name is Eric Schmadel and I’ve been a photojournalist for the last 15 years. I’ve spent 12, going on 13 of those years at the Tribune-Review in Greensburg, Pennsylvania. I’ve won some awards on the local, state and national level for my work, but that’s not what’s important here. I’d like to share a little about my background in the field and my opinions on action photography. I became a photojournalist when I had two revelations as a psychology major in college. One was that I started to believe more in psychiatry (and I wasn’t going to med school) and the second was that I should not be responsible for anyone’s mental health. I needed to find a career that suited me. My roommate at that time was the photography editor at the student newspaper so I informed him that I was going to buy a camera and take a photography class and that he should hire me. He did and after a series of right place/right time job openings, I landed in Greensburg. Though I cover anything that happens on my shift on a daily basis, I would say that 75% of what I shoot is sports. My shift is structured in a way that I am one of the main high school sports photographers in our chain of newspapers in the Greater Pittsburgh region. I do some college sports, but that accounts for less than 10% of the sports photography that I do. I suppose I became a sports photographer by default because of my shift and I fell in love with it. Sport, any sport, any game, holds the potential to make a beautiful and timeless photograph. The peak action, the moments around that action and the old “thrill of victory, agony of defeat” can be very rewarding as a photographer. I want to touch on the fact that first and foremost, I’m a photojournalist, not a photographer when it comes to sports coverage. I am working hard to produce the best image I can that tells the story of a game. That can be anything from the girl that scored the game-winning basket in a high school playoff game to a dejected senior football player that just lost the last heart-breaking game of his college career and everything in between. I’ve passed over wonderful action shots of dropped passes and meaningless tackles in my edits because they don’t contribute anything to the story of the game once it goes to print. That, to me, is where the art lies in sport photography and in action photography. I want to see meaningful peak action. As for judging other styles of action or motion photography, well that takes a little more interpretation. I’ve won awards for photos where I’ve panned with the subject to blur the action and give a sense of fluidity and I’ve used high-powered strobes to stop droplets of water. I think what separates art from snapshots is highly subjective. What I may give only a passing glance to may be the world’s most wonderful photo to another viewer. As a juror, I’ll be looking for any number of qualities. The first one being that intangible connection one feels when you first see a photograph that you like. We’ve all seen those photos and we’ve all taken them. You know the photo that you can’t stop looking at because you can’t believe that everything came together just right to make it happen. Secondly, I’ll be looking for technique. 99 times out of 100, it’s not enough to just point the camera at the action and stop it. Composition does still count for something in the world of art. I can’t tell you how many times I’ve seen a photo and thought “if the photographer had just taken a knee and looked up at the subject rather than down,” or “that’s a nice image, but all I see is that light pole growing out of the subject’s head.” Lastly, I like to see subjects that I’ve seen a million times before in a new light. Bird in flight stopped in mid-air? Maybe try panning with it and keeping it’s eye in focus. These aren’t suggestions (yet), just the musings of a juror. I know every serious photographer has probably heard these tips before, but it can’t hurt to repeat them. When you’re looking for action shots there are two basic ways to go about it: stop the action or interpret the action. Stopping the action with a fast shutter and a large aperture is best for things like sports and most wildlife action photography. You’re looking to show the viewer the peak action in a way exposes elements that were too fast for the eye to see. Rippling muscle and a grimace on an enthusiastic slam dunk or the spread wings of a hummingbird at a feeder are good examples of why you might want to go this route. Panning with your subject or doing multiple exposures are better suited to showing the way things move. An incredible photo of (then) Arizona Diamondback pitcher Randy Johnson comes to mind where the photographer used a slower shutter speed and moved the camera with his wind up and delivery (while keeping his face and necklace sharp) to give a sense of motion to the image. Multiple exposures work well to show things like how a skateboarder moves during a kickflip. That can be accomplished with a flash that has a repeating strobe. The only other suggestion I have for action photography is this: know your subject. My most successful sports images have come from sports and teams that I know and understand. For example, you are more likely to get a great photo of a reception in a football game if you know which receiver a team likes to go to on third and long. All this takes me to my last point. Through the internet, I’ve learned that there are thousands, if not hundreds of thousands of extremely talented photographers out there. I am by no means the best there is. And any one of them can make a great photo at a professional sporting event with great gear and that wonderful stadium and arena lighting. But if you ask me, the best sports photographers in the world are the ones producing consistently good work in dimly lit high school or middle school facilities. When you start getting recognition for that work, that’s when you feel professionally successful. That and when Aunt Sally calls you up to order 30 prints because you took the best photo of her niece playing field hockey that she’s ever seen! On the Go: Motion Photography Juried Online Art Exhibit will be accepting entries through 31 March 2011. The winning piece to be selected by juror Eric Schmadel will receive a $150 cash prize, courtesy of EBSQ. Henna has been found throughout history. The mummies of the ancient Pharaohs show traces of henna on their hair and nails. Henna is included in many ancient rituals and ceremonies: weddings, circumcisions, births, and other rites of passage and celebrations. Henna has enjoyed a resurgence as an art form in the west, thanks to prominent flashes of it among celebrities in the media. Although henna has a rich past with many customs and traditions, it is also a contemporary art form. It’s fun and easy, and any wild mistakes will wear off in a couple of weeks, and you can start again. Henna can be used to “test-drive” an actual inked tattoo, or just as a temporary form of expression. The plant, Lawsonia Inermis, is of the Myrtle family, and is found in arid areas including India, Pakistan, Yemen, Morocco, northern Africa, northern Australasia, and Egypt. It has traveled along the Silk Road, and spread all along the borders of the Black Sea. There are as many many varieties of henna recipes. The secret to good henna application is having the right ingredients and the correct mix. It’s kind of like a science project. Henna will stain keratin, a fibrous structural protein, found in hair, nails, hooves, horn, as well as skin and leather. Henna will also stain wood, wool, egg shells, silk, and turtle shell. For body art, the ingredients are simple – something acidic, something sweet, and “terps”, which are essential oils with a high monoterpene alcohol content. This magic combination sets off the dye reaction, freeing the lawsone molecule from the henna leaf and allowing it to bind with keratin. Come learn a little about the history of Henna arts, Henna Mixology (the secret is in the mixing! ), and safe application of Henna, as well as how to avoid unsafe practices masquerading as “henna”. “WendyMehndi” the Henna Faerie (of Waltzing Dog Studios) is a Henna Artist, Glitter Artist, and Face Painter (among many other artistic disciplines). Dressed outrageously, she can be found delightedly drawing unique freehand designs on people using natural henna, body paint, and glitter. When not decorating and enjoying people, Wendy works in fibre and other media. She lives in Orange County, North Carolina with her husband and children as well as their dogs and cats. 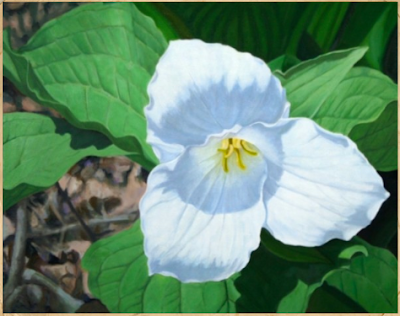 Trillium class will take you further as you complete your own painting. paint like the Old Masters. So–if you’re hankering to bone up your oil skills, here’s your chance! For further inspiration, please be sure to visit Harlan’s portfolio at EBSQ. There’s a lot of pieces that look like photos. Don’t let the hyper-realism fool you; those are paintings, my friend!